The highly modified Dodge truck built by Amy and EJ Fitzgerald, owners of Cool Hand Customs, will feature three E3 high-performance ignition products: E3 Billet Distributor, Race Spark Plugs and Race Wires. The truck will be equipped with a 440 big block and a 1970’s style, torsion bar Dodge Challenger suspension. The truck’s paint scheme will be an exterior satin white with green and black accents with the frame painted silver and the short block painted in E3’s distinctive green logo color. 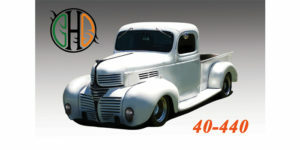 The ’40 440 truck will make its first public appearance at SEMA. For more information about E3 spark plugs and performance ignition products, visit e3sparkplugs.com.